As the leading social media agency that built the world’s first bot within the automotive industry, we create breakthrough bot experiences for all of our brands. Start delivering intimate, personalised customer experiences at scale. Millions of people across MENA use Messenger to connect with friends and businesses, everyday. We help super-charge those connections with intuitive bots that convert conversations into customers. Using your objectives, we form a perfectly tailored bot strategy that sends the right consumer message and drives the needed results. We map out the consumer journey from start to finish, designing the conversation architecture to provide a seamless experience. All of our developed bots come with a fully optimized CMS and integrated leads/data collection so you can keep up with your consumers. We introduce your bot to the world with planned campaigns that reach your targeted audience through click-to-message ads. To enhance brand experience with a younger audience, Mercedes-Benz needed an innovative solution to handle custom queries and requests in real-time. In August 2016, we launched the Mercedes-Benz Cars Middle East chatbot, a powerful new way to enhance brand experience and interact with regional consumers at scale. Helped customers explore our range of cars and book a test drive, all through chat. Even made personalized SUV model recommendations based on the users’ driving habits. Invited young drivers to pick their favorite car & unlock secret missions. Sent encrypted booking data directly to relevant general distributors across the region. Within the first few months, the bot received over 17,000 unique conversations and drove a 6,200% increase in conversations in under 4 months! Driving test-drives and industry leading conversion rates with the the Mercedes-Benz Cars Messenger Bot. The first award-winning agency to bring bots to the region! Chat up one of our friendly bots today to test out the AI experience. 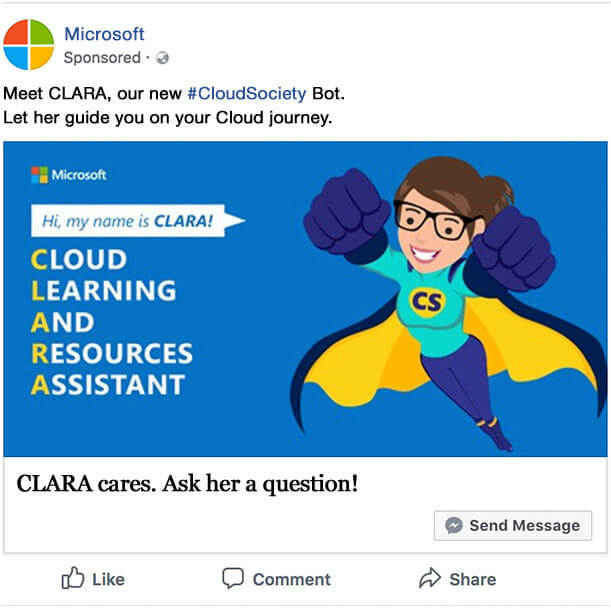 CLARA (Cloud Learning And Resources Assistant) was built to educate users and generate leads for their online platform, Cloud Society. 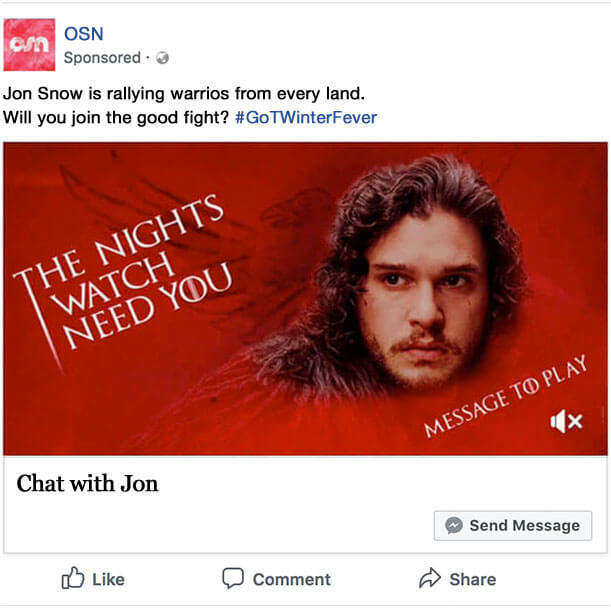 In light of the latest season of Game of Thones, we conceptualised and developed an interactive bot that created a gamified consumer experience to encourage users to watch it on OSN. 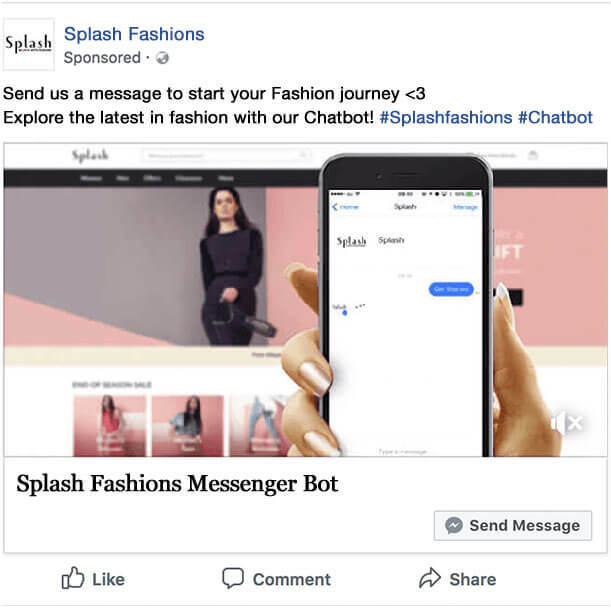 For the release of the Splash Spring fashion & fragrance lines, we built an informative bot that allowed users to browse through the newest collections to ultimately help drive users to their e-commerce website. 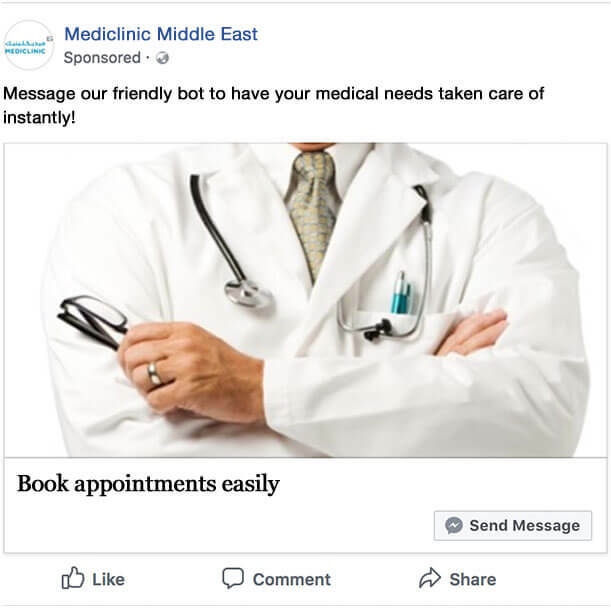 With aim to make appointments more accessible, we developed a bot that allowed new patients to book hospital visits easily for MediClinic and quickly learn about general hospital information such as locations. 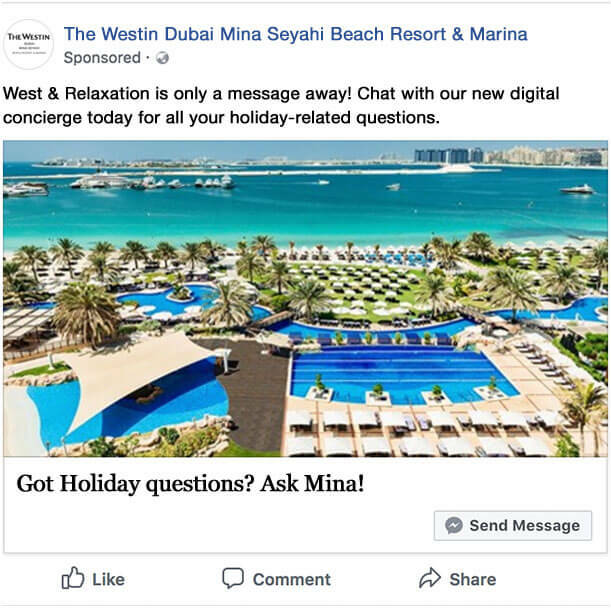 We built a bot that acts as a digital concierge to guide potential visitors through the different offerings of the Westin Mina Seyahi to help push conversions. Bots can do almost anything - and we can tailor them to achieve your goals, no matter what they are. Showcase your products and share the latest offers and news stories as targeted notifications. Collect data, book appointments, capture consumer’s location and more. Keep up to date with your customers’ post-purchase experiences. Let customers discover, share and shop directly through their messenger. Get in touch to find out how we can create powerful bots to build your brand and engage with your consumers.